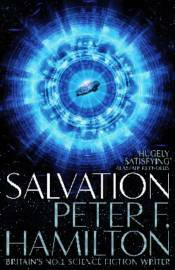 An alien shipwreck is discovered on a planet at the very limits of human expansion � so Security Director Feriton Kayne selects a team to investigate. The ship�s sinister cargo not only raises bewildering questions, but could also foreshadow humanity�s extinction. It will be up to the team to bring back answers, and the consequences of this voyage will change everything. Back on Earth, we can now make deserts bloom and extend lifespans indefinitely, so humanity seems invulnerable. We therefore welcomed the Olyix to Earth when they contacted us. They needed fuel for their pilgrimage across the galaxy � and in exchange they helped us advance our technology. But were the Olyix a blessing or a curse? Many lightyears from Earth, Dellian and his clan of genetically-engineered soldiers are raised with one goal. They must confront and destroy their ancient adversary. The enemy caused mankind to flee across the galaxy and they hunt us still. If they aren�t stopped, we will be wiped out � and we�re running out of time.